Grab your cowboy boots, jump in your RV, and get on down to the most highly anticipated country music festival of the year! Stagecoach embraces the country lifestyle from RV’s to bull-riding while allowing families, friends and country music lovers to connect. Once again, the California desert will be filled with the toe-tapping sounds of all types of country music as the Stagecoach 2015 festival rolls into town. With performances by the top country music acts, this festival has something for everyone who follows country music. This annual event just released their lineup for the 2015 festival, taking place from April 24th to the 26th. Tickets for the event go on sale today, October 14th and are sure to sell out fast. Our 2015 contest has expired. Congratulations to Amy Hutchins and Corina Sanchez! Be sure to stay tuned for next year’s big announcement. 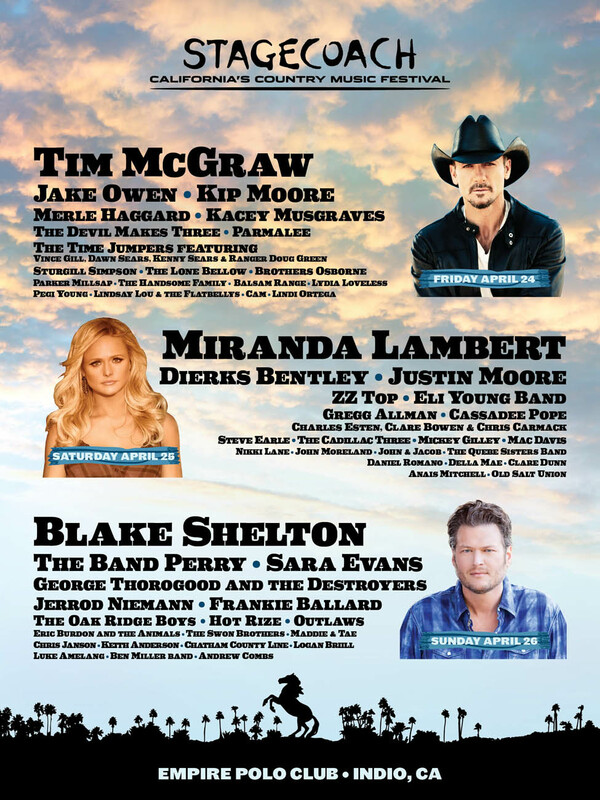 The lineup for this massive event includes headliners like Miranda Lambert, Tim McGraw, Blake Shelton and Jake Owen. Friday, April 24th will be the kick off with Tim McGraw as the day’s headliner and following acts that day will be Jake Owen, Kip Moon, the Devil Makes Three and more. Miranda Lambert headlines Saturday, April 25th, and you will also see Justin Moore, Eli Young Band, Dierks Bentley and ZZ Top taking the stage. The final day of the festival, Sunday, April 26th, will feature Blake Shelton as the headliner, with The Band Perry, Sara Evans, George Thorogood and the Destroyers and more wrapping up the three-day festival. For a full schedule list check out the official Stagecoach website or view their lineup flyer. Emerald Desert RV Resort is once again teaming up with KSON as the official Home-Away-From-Home and is super close to the Empire Polo grounds. We offer full hook-up sites at a great festival rate. Make sure you book early to secure your spot as this event weekend is sure to sell out. Our Stagecoach package starts at only $180 a person and even includes transportation to and from the festival. Click here to see more on this incredible special. JUST ADDED! Both winners will get a free rental from JUCY Rentals. Check out their rental vans on their website here. Plus, we’re giving away two pairs of festival tickets, so don’t miss the chance to be one of TWO WINNERS that will win a pair of free passes to this much-anticipated event! Just sign up below for a chance to win. More details to come so keep checking back. Make sure to follow us on Facebook as well for upcoming Stagecoach info.